Oh, I am so very happy. 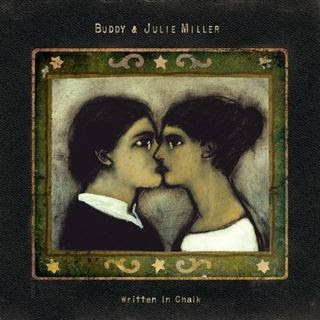 There's a new album by Buddy & Julie Miller ~ Written in Chalk. I've been waiting for a follow-up to their last record most impatiently. I'm a big, big fan of this alt. country duo. Johnny and I will drop by a bookstore this afternoon for my brother's birthday gifts, but I couldn't possibly wait 'til then to buy Written in Chalk. Nor could I wait for an Amazon snail mail delivery; not this time. Since the full-length album isn't available on iTunes, I made a purchase via Amazon mp3 - just $8.99. Right this very minute, my ears are geeked up and rockin'. More importantly, Buddy Miller is recovering from triple bypass heart surgery, so please keep him in your prayers. I've heard that not only are these two mucho talented, but they're also super good people (not surprisingly). I'd love to see them continue to befriend and inspire folks for many years to come. And please, God, bring them back to Houston's Mucky Duck in good health.